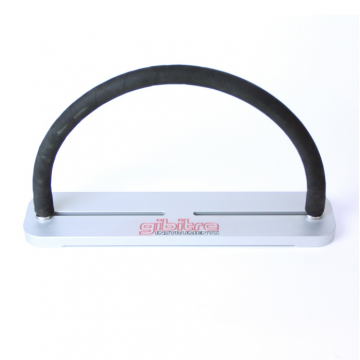 Gibitre Ozone check is a complete ozone cabinet, produced in conformity with international standards, which permits to estimate the resistance to cracking under static or dynamic tensile strain of standard samples or technical articles made of vulcanized or thermoplastic rubbers. The instrument permits the regulation of ozone concentration, air flow speed, temperature and relative humidity (optional) to comply with international standard methods. The generation and shooting down of ozonized airflow is carried out in closed circuit through self-regenerating active carbon filter in order to meet safety requirements and to make an aspiration system unnecessary. The instrument enables Ozone deterioration tests of rubber samples and rubber parts to be carried out in conformity with ISO 1431, 3011, 7326, ASTM D 1149, 4575, 3395, 518, DIN 53 509 International standards. - Relative Humidity, between 40 and 90% (optional). • The instrument automatically locks the opening of the instrument when the ozone concentration exceeds 10 pphm to prevent undesired contact with ozonized air. • The generation and shooting down of the Ozonized airflow is made in closed circuit in order to meet safety requirements and to render an aspiration system unnecessary. • Safety sensors protect the instrument from excessive temperature and humidity due to incorrect set. 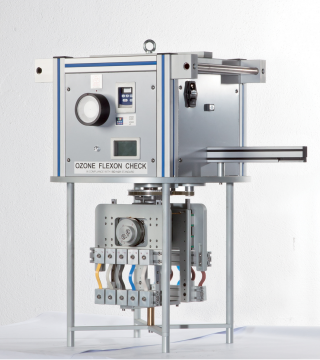 Gibitre Ozone Tester is the only instrument with a cylindrical test chamber with symmetrical air extraction by means of a double-chamber. 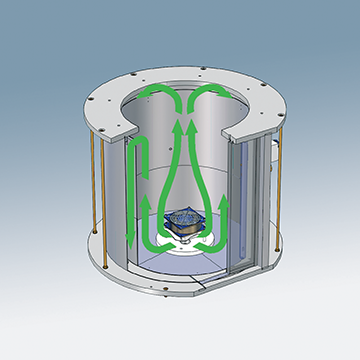 This unique feature ensures a homogeneous distribution of ozonized air inside the chamber that could not be obtained with a cubic chamber. The chamber is made of stainless steel. 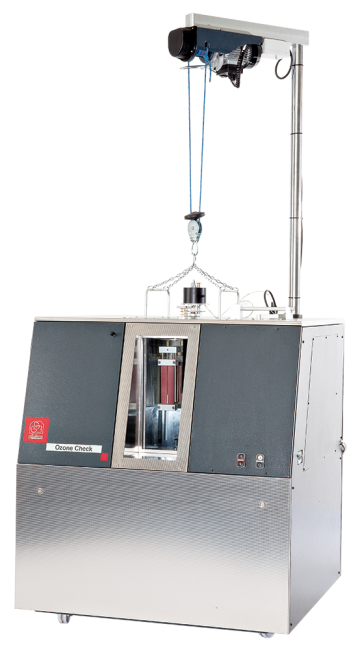 The instrument has an inspection windows in the front with two lights on the sides which permit to inspect the samples during the test without need of stopping the test and removing the samples from the chamber. The instrument continuously stores the working conditions. After an electrical black out, the user can restart the program and continue the interrupted test. Humidity control system to regulate the Relative Humidity in test chamber between 40 and 90%. This option permits to test ozone resistance in presence of humidity. The device includes suitable refrigerating unit and a cold steam generator. Sample holder for the static strain of 2 samples with adjustable distance of the grips. 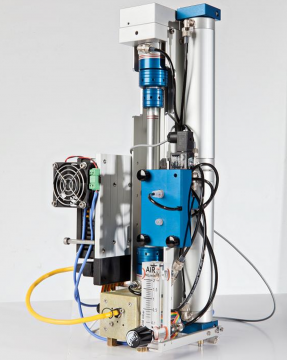 Static test piece holder with planetary effect, which moves the test pieces over the whole volume of the chamber for a more homogeneous ozone atmosphere exposition. In compliance with ISO 1431-1 standard. In compliance with ISO 1431, ASTM D1149 and SAE J1401. To be inserted into test chamber for the study of ozone resistance of cured rubber under dynamic conditions (from 3 to 30 cycles/min - 0.05 to 0.5 Hz). The program permits the preparation of customer-defined test procedures defining test parameters: ozone concentration, temperature, relative humidity (optional), number of air changes per minute and test time. After the test has started, the program automatically regulates the instrument to meet the requirements for the selected test procedure. The Ozone Concentration, the relative humidity and the test temperature during test time are automatically displayed in the graph. Different groups of sample with independent test identification and test time can be tested at the same time. 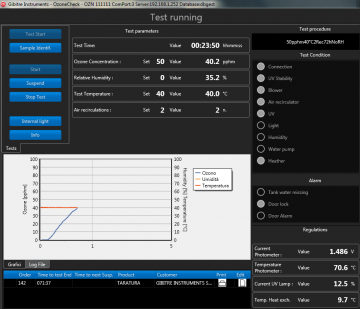 The instrument automatically pauses when one of the groups of samples has come to the end of test time. After sample inspection the instrument is restarted to proceed with following tests. 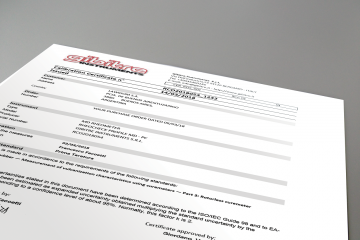 At the end of the test, a Test Report can be printed and stored. The report includes: test identification data, test parameters, sample characteristics, curves of test parameters and notes regarding test results. 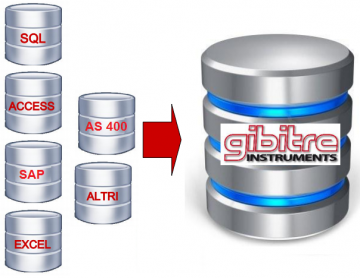 The program automatically activates the instrument shutdown cycle at the end of the defined test time. The program permits the electronic calibration of Ozone Concentration, relative humidity and temperature. Test identification data, test parameters, sample characteristics, curves of ozone concentration and temperature, notes about results, images uploaded during the test. From Room Temperature +5°C to 70°C. Accuracy: 0.1°C. Integrated heat interchanger for connection to a water supply. From 15°C to 70°C. Accuracy: 0.1°C. Adjustable between 40 and 90%. This option includes ultrasonic humidity Generator and Refrigeration unit. Adjustable from 0,5 to 3 changes/min (air change speed between 7 and 39 mm/sec). Internal fan according to ISO 1431. Closed circuit with continuous ozone production and shooting down through self regenerating active carbon filter. 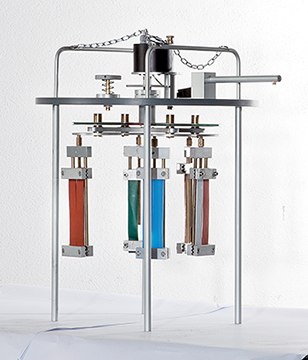 • Sample holders for static strain and planetary displacement according to ISO 1431-1 standard (32 to 64 samples).